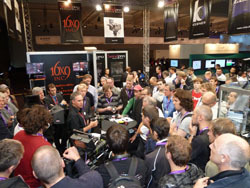 While wandering the exhibit halls, I noticed a commotion at the Band Pro booth. There was what appeared to be a paparazzi-type crowd gathered. Who could it be? Madonna? Justin Bieber? Fabio? I craned my neck just so and caught the smallest glimpse of…. Ted Schilowitz from Red (see photo below). He had a working version of Epic. I almost expected this to turn into a Beatles movie, with Ted and the Epic running for their lives down European streets. Another take-away from IBC was the realization that 3D stereo is making its mark. While not everyone is working in stereo, everyone wants to be prepared for when their clients do start making requests, and product makers are obliging. Post is helping as well. This month, we tackle the topic of compositing 3D stereo with a roundtable of experienced pros. One of those pros is consultant David Cox, who kindly answered all of our questions. He also brought up the issue of disparity and post producing for 3D stereo. However, Cox reports there are two occasions when it needs to be dealt with in post. “One is where the shoot wasn’t right because the cameras weren’t set up properly; the other is where the shots are good individually, but when cut together make an awkward transition,” he says. “This is not easy [to fix in post], because to change the disparity you need to be able to retrospectively change the distance between the cameras, which means the post tool has to recreate pixels of the scene that might have been obscured. You also need the tools to measure disparity as broadcasters have placed limits on allowable amounts of disparity. If you can’t measure it, you won’t know if you’re making ‘legal’ content.” He offers this tip: a post tool can’t be seen as being 3D-capable if it doesn’t have tools to control and measure disparity. Rob Trent, lead compositor at Asylum (www.asylumfx.com) in Santa Monica, details his experience, including work on a recent Bud Light spot.